Ever since Savanna can sit on her own and grab toys, I battled with Joshua on the issue of sharing with Savanna. He would rip toys out of Savanna’s hands, yell “mine! !”, and I would get so angry with him. We have often both ended up in tears because he refused to share, and I refused to accept his behavior. This went on for months, and I was tired of hearing myself yell and threaten to throw away whatever toy he won’t share. Then I read this book called Sibling without Rivalry. It changed my world. I won’t go into the details of the book in this post. What Cliff and I started to do is allow Joshua to NOT share. His matchbox cars are his most prized possessions, so we told him one evening that he no longer has to share his cars with Savanna. I apologized to him for making him share, and I told him that he can decide if he wants to share his cars. I think he was a little surprised, but he agreed that it’s a good idea to not share his cars. For the next few weeks, he hung onto his cars like a hawk. If Savanna ever got her hands on one, he swooped in to take it away, and righteously tell her that those were his cars and he didn’t have to share. I would chime in and tell Savanna that she can find another toy to play with, because those cars belonged to Joshua. I would also encourage Joshua to bring Savanna a different toy so that she has something to play with, and he would gladly bring her something. This greatly reduced my stress level with the whole sharing business. I think Joshua felt like he has control over his favorite toys and that his wishes were respected. What I didn’t expect all it was that 2 weeks later, Joshua started to share his cars with Savanna on his own initiative. 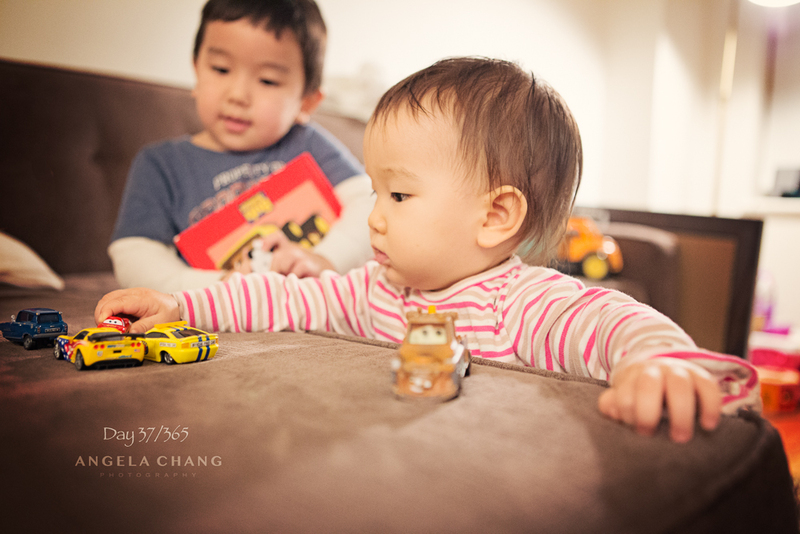 He actually offered her the cars to play with. When this started happening, my jaw just dropped. I even said to Joshua, “Are you sure? You know you don’t have to share, right?” He would nonchalantly tell me he will share. This has been a huge parenting lesson for me. I realized that by forcing Joshua to share, he never experienced the joy of sharing. But by allowing him to make the decision about sharing, he got to experience what it’s like to make someone else happy on his own initiative. This entry was posted in 365, Family, Photography and tagged 365, kids, sharing by angelasaito. Bookmark the permalink.